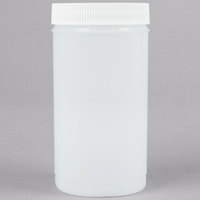 This Carlisle PS80200 Store 'N Pour 1 gallon white container with colored cap is perfect for storing liquids! 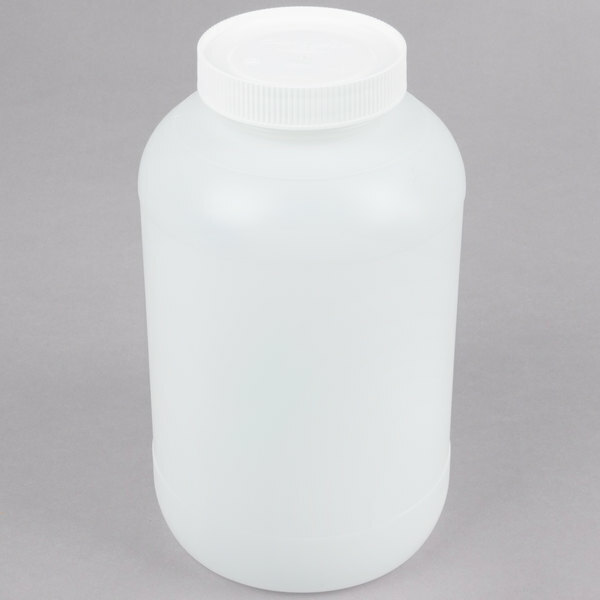 Simply storage of liquid ingredients at your busy bar or restaurant with this handy Store 'N Pour 1 gallon container and cap. It can be used to prepare juices, syrups, cocktail mixtures, or salad dressings ahead of time so you don't run out at peak serving times. 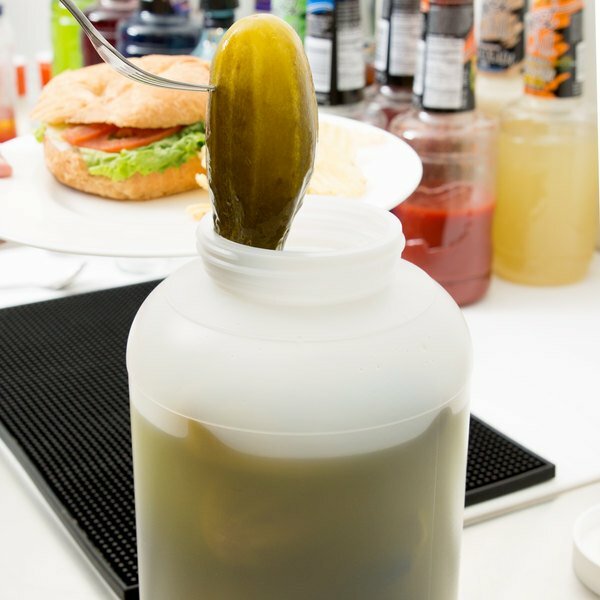 With the ability to withstand temperatures from -40 to 180 degrees Fahrenheit, this storage solution is versatile enough to contain both hot and cold liquids. "Great containers for just about anything, we use them for all our homemade dressings, barbecue sauce and other condiments. I use them daily for lots of things." 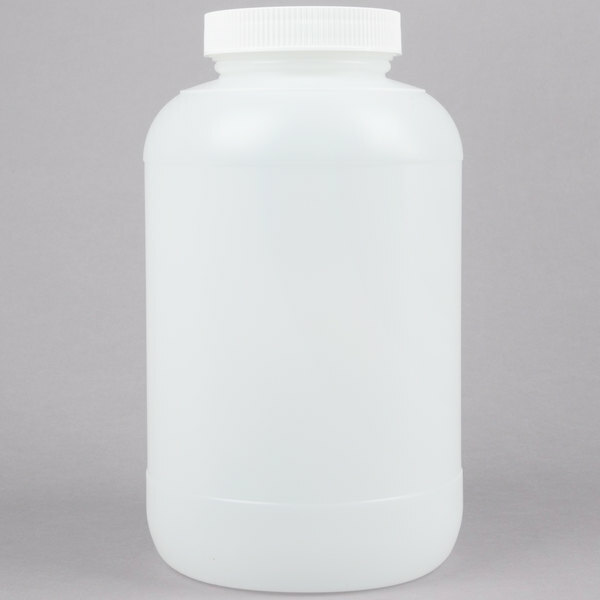 Made of high density, break-resistant polyethylene, this container boasts straight walls with no sharp interior edges, ensuring it won't collect food particles or harbor bacteria. 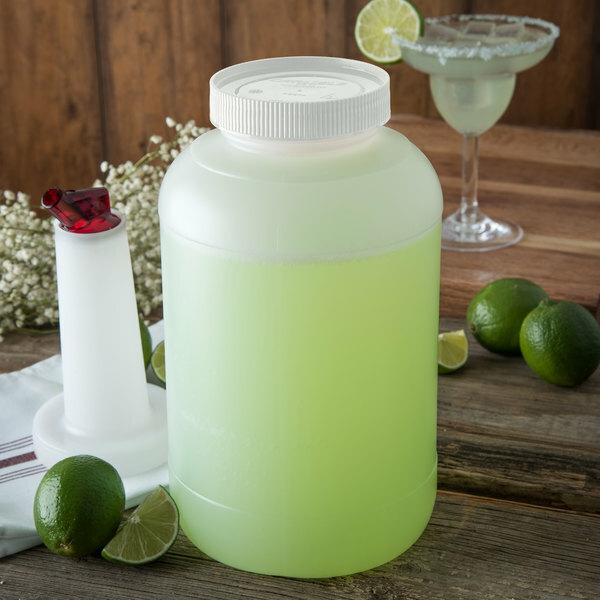 Whether your bartenders are creating your most popular drink mixtures at the bar or your cooks are whisking up new marinades in the kitchen, this Store 'N Pour container and cap will provide you and your staff with an easy way to store liquid products. Are these lids leak- proof? 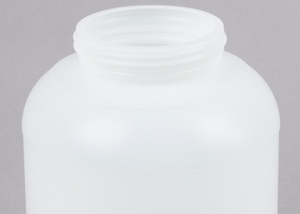 When the caps are tightened properly, the lids are airtight and leak-proof. 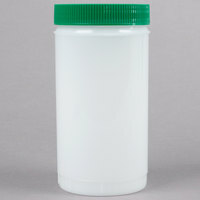 However, the threads on the container are designed so that if you turn the lid past its tightest point, it will become loose again and could leak if tipped over. To prevent leaking only tighten the lid until it is snug. Do the lids pop off? The lids are secured by screwing onto the container and when tightened properly, will not pop off unless force is acted against the lid. 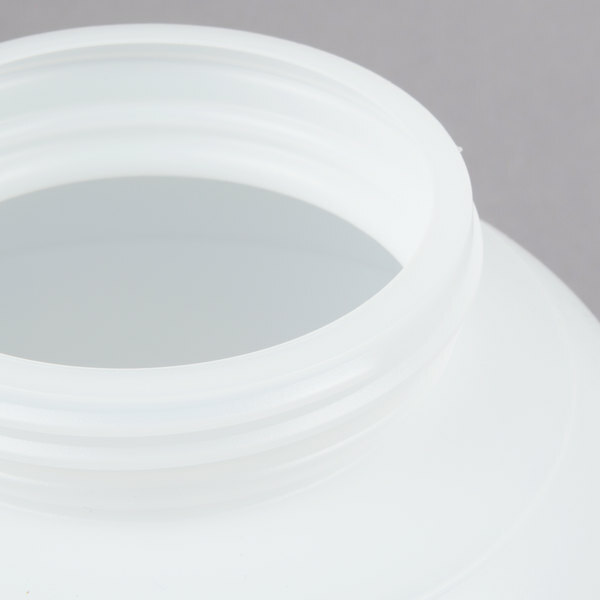 To avoid the lids popping off, do not squeeze the container when it is full and do not pick the container up by the lid when it is full. The lids do not fit tightly. These have caused a couple of messes in our restaurant, from having the lids pop off. These will be thrown away to avoid another disaster. Thank you for the review, Geoff. We are sorry these lids have caused issues at your restaurant! A Customer Solutions Representative will be in contact with you about this. Thank you for your review! Feel free to contact a Customer Solutions Representative; we would be happy to help! We've been using these gallons containers for 5 years now to transport our juices. They are durable and clean easily. The only warning is to grab them from the bottom of the container as you may have a cap that is not completely secure, we've had multiple juice spills! We have a few of these on hand for backup cocktail mixes that we make. We use all fresh juices for our cocktails and need to make a lot of backup to keep on hand. Durable, cleans well, serves its purpose. Should be a negative 5 star. Lids won't tighten and we had messes. Throwed in trash to stop further messes. Waste of money and time loss. We appreciate your feedback! We’re sorry this is not working for you. A Customer Solutions Representative will be contacting you soon. Containers are great, lids not so much. The colored caps fit fine as long as the jugs are empty. Once filled, the tops just pull off and do not screw on properly. I literally has to tape each jug from top to bottom so lids would stay on. We use these to store bbq sauce. We no longer have to save every mayo container we come across. They are very sturdy. We will be back for more! 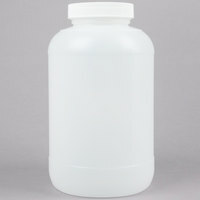 The Carlisle Store "N Pour 1 Gallon White Container with Colored Cap is great! It is very sturdy and easy to clean. It is great for holding homemade sauces. This is a perfect item for any restaurant. 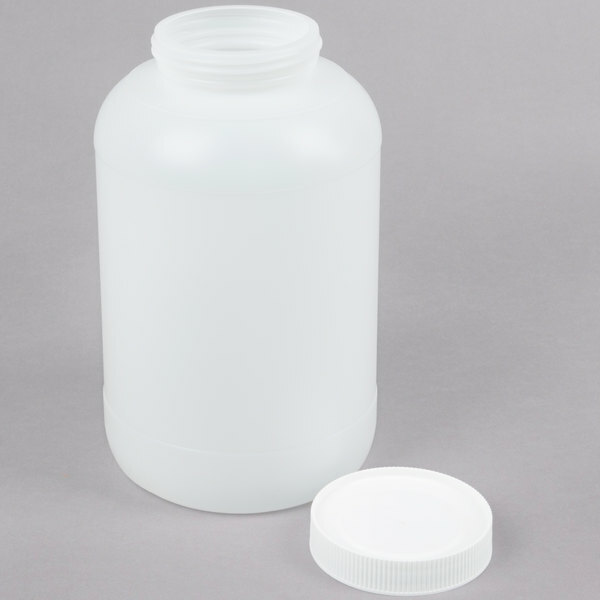 Nice gallon containers with Sturdy lid. Four fit nice In plastic milk crate,makes for easy transportation. Recommend assorted pump kit #712P7310 if you need lid with pump. Love these gallon jugs. I make my own BBQ sauces and hot sauces. These jugs come in handy, there easy to freeze product in. Just awesome. I've been using this containers and they have last me quite a while, still using it, they even have caps with a hole so i can pour the liquid out without the need to remove the cap. I bought three one gallon containers to store homemade sauce. It is easy to pour without making a big mess. Only two was shipped. I contacted customer service and they promptly responded and shipped the item to me. I was very impressed at the excellent customer service. Great containers for just about anything, we use them for all our homemade dressings, barbecue sauce and other condiments. I use them daily for lots of things. These were just okay. They were a thick plastic, which was nice, but the opening was much smaller than I thought it would be. Which made it hard to get the stuff we stored in it out. 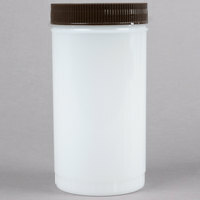 I ordered two of these, and one bottle had a brown lid and the other one had a green lid. I do not mind the color cause I won't be using the lids. It fits perfectly with a pump I got from Webstaurant. 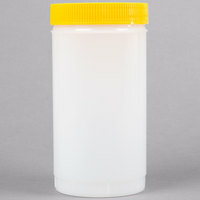 What a great find, we bought many of the dry items from the Webstaurant Store. They hold a 5lb bag of dry goods nicely. Easy to store. Husband being a retired chef says these are great in any chefs kitchen. I bought these jars to store grain in and they are the perfect size for the small amounts of grain that i store. the jar is heavy duty so that i do not have to worry about them spilling and getting all over the place. great product. 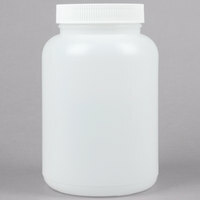 We are very happy with these gallon plastic jars. 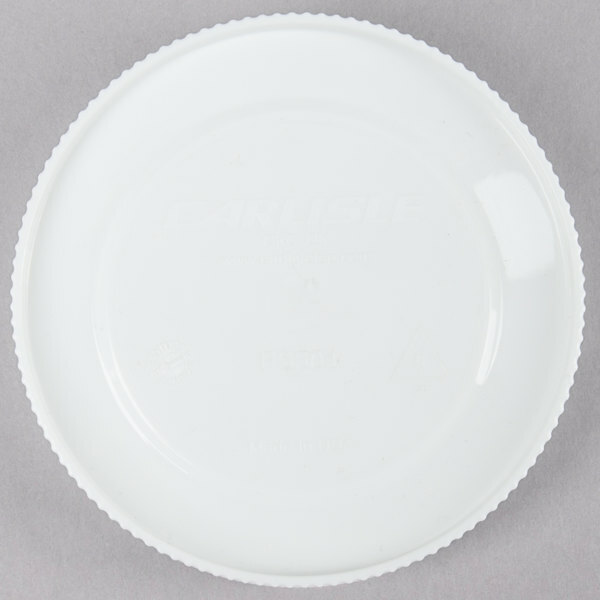 The lids are tight fitting to help keep ingredients fresh and available for use. 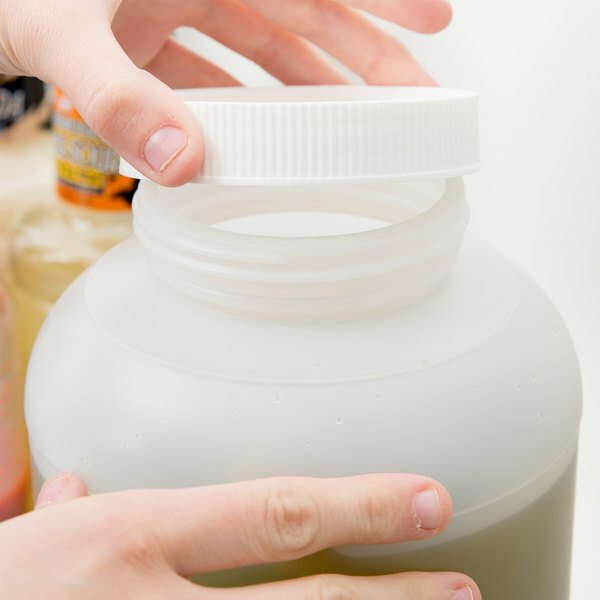 The multi-color lids are helpful for us to know which products are stored in which jars. Perfect for storing anything that will fit in the half gallon container. Perfect for storing salad dressings. Also looks clean and is air tight. The various colors help in storing juice items.